What enables the ‘Zobop’ works to stand such repetition is their remarkable sensitivity to even the slightest variations in a particular space. Different colours and thicknesses of vinyl tape (in this case mad fluorescents, green, blue and silver), applied to the gallery’s floor from the edges in, build to create zooming corners and rippling curves emanating from hitherto inconsequential incidents in the architecture. The effect for the viewer is one of exaggerated perceptual awareness coupled with an enjoyable optical loopiness that is not unlike being on certain kinds of hallucinogens. Very often, as with this exhibition, a ‘Zobop’ merely sets the stage for other of Lambie’s works, installed on and above it. 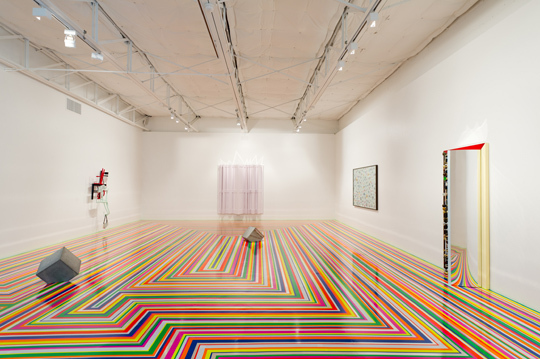 Although Lambie claims not to make objects specially to be displayed on a ‘Zobop’ floor, his work certainly benefits from being seen in concert. Broken mirrors – recurrent in Lambie’s formal and conceptual vocabulary – look great when placed near stripes of coloured vinyl. When applied to the outside of handbags, as in the wall-mounted sculptures Danceteria X (2007) and Untitled (2008), the shards of mirror happily drink up the patterns of the floor. In the best of Lambie’s work, superficial things such as pop music, dancing and getting dressed up on a Saturday night approach a transcendent profundity. Another untitled wall-based work from 2008 is a framed collage in which pieces of broken mirror skitter the reflections around photographs of women’s eyes cut from posters or magazines. The single eyes are stranded on islands of differently coloured gloss paint; from a distance the all-over effect is pleasing, even innocuous, but up close the staring, made-up eyes become grotesque, as does our own coalescing reflection in the uneven mirrors. (Owing to the small size of each piece of mirror, it’s only when one’s own eyes are roughly the same size as those in the collage that one’s reflection becomes recognisable.) There is something happening here to do with perception and our relation to the art object that is hard to pin down; like much of Lambie’s work, it is not made to be instructive or illuminating, but to be perplexing in a candy-coated, unthreatening way. Covering up, sealing off and reflecting back are all defensive mechanisms that Lambie uses as sculptural or pictorial techniques. Two sculptures, both titled Sonic Reducer (2008), entomb 12-inch records in cubes of concrete, never to be heard again. A collage titled Careless Whisper (2009), shows a young George Michael (the foundation’s co-director) mostly hidden behind wreaths of flowers cut from oil paintings. Get Yr Freak On (2008) takes its title, inexplicably, from a Missy Elliott track. It consists of a gloss-painted wooden door, half open and bristling with knobs, handles, pulls and levers. None of them are any use; the gap between the open door and its frame is sealed by a curving panel of mirror (which, once again, distorts the fluorescent lines of the floor in zany and marvellous ways.) The door, in this instance, seems like the kind one would find on a teenage bedroom, locked from within; while pop music (and art) might ostensibly be about self-expression and -identification, they are also, Lambie reminds us, both packed full of secrets and codes and unfathomable desires.